Had anyone asked me before November 1st 2013 to guess how many people in the United States were disabled, my answer probably would have been a vague “not very many” or “a very small percentage.” To me that answer is not surprising because before that day I wasn’t disabled and I submit that most of us tend to think that way. However, on 1 November, I suffered an accident that left me disabled. Before November 1st 2013, I would never have believed that in 2010 there were an estimated (2) 56.7 million disabled Americans (3). According to a U.S. Census Bureau report by Matthew W. Brault and issued in July 2012, 38.3 million have disabilities that are categorized as severe. The Census Bureau report categorizes severe disabilities into three categories; communicative, mental, and physical. 1. Blindness or difficulty seeing. 2. Deafness or difficulty hearing. 1. Learning disability, intellectual disability, developmental disability or Alzheimer’s disease, senility, or dementia. 2. Some other mental or emotional condition that seriously interfered with everyday activities. 1. Use a wheelchair, cane, crutches, or walker. 2. Have difficulty walking a quarter of a mile, climbing a flight of stairs, lifting something as heavy as a 10-pound bag of groceries, grasping objects, or getting in or out of bed. rupture, high blood pressure, kidney problems, lung or respiratory problem, missing limbs, paralysis, stiffness or deformity of limbs, stomach/digestive problems, stroke, thyroid problem, or tumor/cyst/growth as a condition contributing to a reported activity limitation. How does your agency rescue and treat someone if they cannot see, hear, or whose speech is difficult to understand? How do you know that those needing rescue and/or treat have severe disabilities? One program to assist responders and those with disabilities was developed by a partnership between Shepherd Center, a rehabilitation hospital for catastrophic injuries in Atlanta, Georgia, and the DeKalb County Fire Department, DeKalb, GA., to create the RESCUE program. This is a community service program providing home alert labels and education for people with physical and or cognitive limitations who find themselves in emergency situations. The mission is to aide in quicker response times and creation of better emergency plans. This program can be duplicated and implemented in your local community. 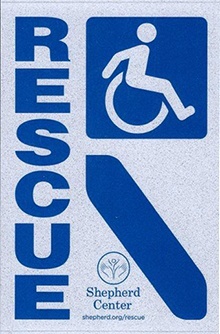 The program resources include a sticker to be placed in a visible front window of a disabled person’s home, an information card, and a letter the disabled person can give to the local fire department. Shepherd Center can help your community start or implement a RESCUE program, regardless of where you are located. For further information, additional stickers or to implement a program in your community, please email Tuwanyo Willis: rescue@shepherd.org. 2. The estimates in the report are based on responses from a sample of the population and may differ from actual values because of sampling variability or other factors. All comparative statements in the report underwent statistical testing and are significant at the 90 percent confidence level unless otherwise noted.